The first time I tried German Potato Salad it was out of a can. Not the best way to be introduced to a dish, but I still enjoyed the tanginess of it and decided to try making it for myself. I’ve made it a few times since then and always really enjoy it. Then I came across an easy recipe from an Amish cookbook and decided to give it a try. I changed it up a bit and used what I had on hand to create my version of this classic dish. 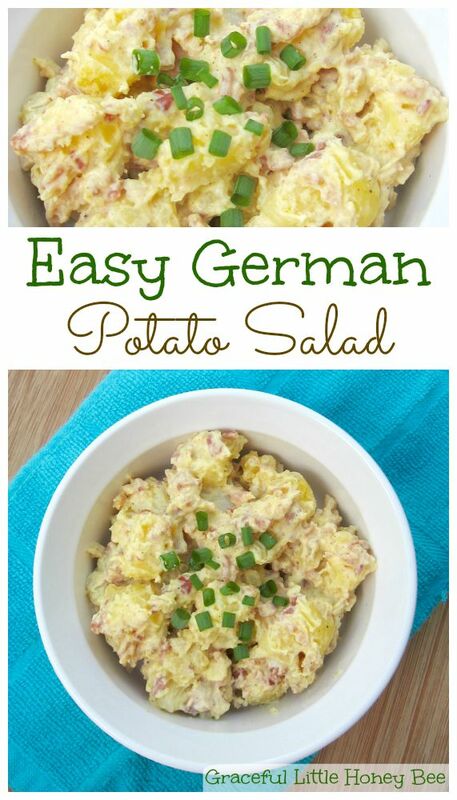 So here is my delicious and Easy German Potato Salad Recipe. I hope you enjoy! Step 1: Boil potatoes until tender. Step 3: Mix remaining ingredients and pour over warm potatoes. Mix remaining ingredients and pour over warm potatoes. You will love it Belinda! I was wondering when I made this recipe how an authentic version would be different. Thanks for letting me know! Sounds delicious!